Yay!? We’ve made it through another week of the One Room Challenge. We are now on week 4 which is crazy! Only two more weeks to go ’till the Eat-In Kitchen reveal. I’m so not even close to being done… it’s a bit scary. But, more on that in a bit. If you have no idea what I’m talking about, I’m participating in the One Room Challenge hosted by Calling It Home. 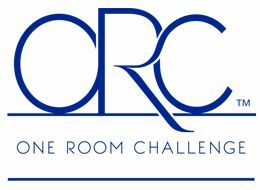 The One Room Challenge is a design challenge that happens twice a year. During the challenge, designers and bloggers come together to focus on transforming their spaces in just six short weeks. The full reveal will be 11/12, but today marks the fourth week of the challenge. Make sure to hop on over to Calling it Home to see all the other participants’ progress. It’s quite inspiring! The first three weeks I felt like I was on a roll. This past week, I drilled into my finger with the kreg jig (pretty bad) and basically had to take a few days off. Then, we headed out of town for the weekend. So, all of that is to say that I haven’t made much progress. Here’s where I’m at with the banquette. Yep, so much to do! Disregard the chair, I was testing out my height measurements. So, other than some non-progress on the banquette. I did hang two gorgeous pieces of art that I got from Minted. I’ve been back and forth on what I want to do with this wall. It may evolve as a gallery wall or I might relocate the frames to the right of the doorframe. I’m not sure. Either way, I’m sure I will get out and do a bit of shopping this weekend so that I have some options. I did stop by Target earlier in the week and they had some cute wall decor items like this stamped metal tray and this octagon metal piece. Ok, I know it will be painful but let’s look at the to-do list. Well, basically I’m good at online shopping because that’s all I got done. Oops. Well, let’s hope I can get my act together for better progress next week. Hopefully your finger is the worst “casualty” in this process! Sorry to hear about that. I feel you on the online shopping – I think I could get a Masters degree in it 🙂 Love this space and am so excited to see next week! For sure! Lol, I need to tell my husband that… masters degree. haha. That darn Kreg! So sorry to hear about your finger–OUCH! I’m kind of freaking out that there are only have two weeks left, but we can do it! This is going to look great. Can’t wait to next week (not rushing on to the reveal here)! Excited to see which light you picked. I know, right?! I’m excited to get the light up! OUCH! I know that must of hurt! Your kitchen so far has come a long way. 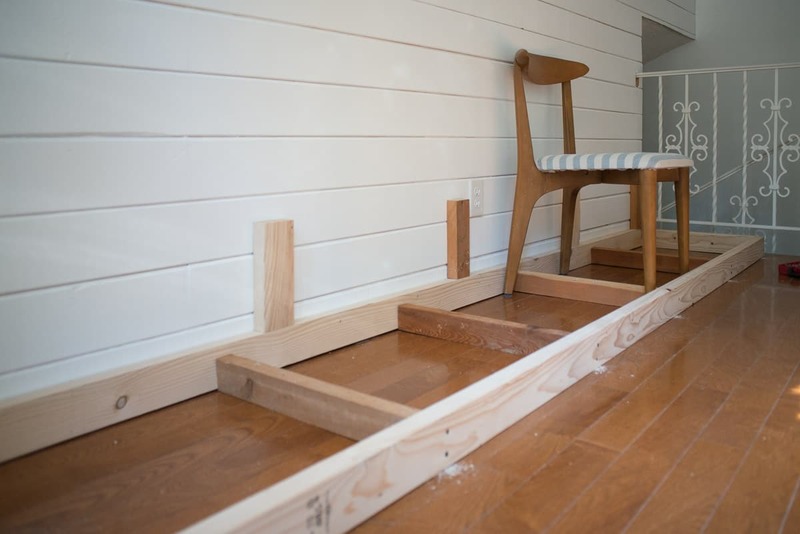 I am loving the plank wall and I look forward to seeing how this space transforms. Oh no!! I am so sorry about your finger- I hope it’s better soon. 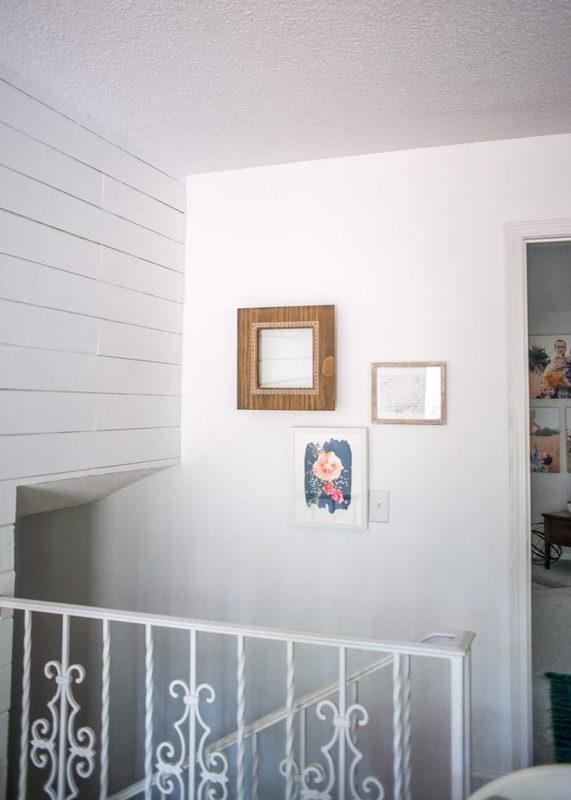 The good news is, your plank wall is so gorgeous you don’t need anything else in your room…I’d come back on reveal day just to drool over that. And the minted art is so pretty! I must admit, I’m freaking out right now about how little time there is to finish everything…but I guess that’s the beauty of these challenges- I’m learning that we don’t finish anything without a deadline! GOOD LUCK friend! Oh man, we work better with deadlines as well. Or at least we get more done. My husband would probably say that I turn in to a raving shrew. lol. Ouch!! Well, I always hit a low energy point in the middle of projects, too. But I LOVE your fabric! The patterns are awesome together. Thanks Naomi! I’m excited to actually use the fabric…now, if only my sewing machine would cooperate! Oh my ouch! I hope your finger gets better, that sounds really awful. You’ve got a great start on the kitchen though – and a slow week just means you’ll have that much more dramatic of a reveal later one! Power through — good luck! Can’t wait to see it. Thanks McKenna. I hope the reveal is dramatic (in a good way of course). OH NO!!!!!!!! Are you okay? Yikes! I’ve been online shopping like a champ too…but I don’t have an acceident to blame on that. I’m SOOOOO behind! Let’s just say that the hubby has taken over the project. I’m scared. lol. But, I’ve been enjoying shopping.